Anyone can make music and I am in no position to say otherwise. However, recently it feels like these “anyones” have become increasingly inescapable. Worse, they are filtering into the mainstream media. I believe this type of lyricism is meant to provide quick entertainment rather than something meaningful. Not that there’s anything wrong with that—in fact, I am particularly fond of some nonsense music. If the music accompaniment is good and the vocals are decent, a good song is a good song regardless of a deeper meaning. However, some of the newer music being made is a little too nonsensical for me. Sadly, songs don’t even make for good listening anymore regardless of lyrical content. “Flossin’” by the Backpack Kid is the first case of evidence. Avoiding the topic of vocal ability on its own, the autotune in the song is done so poorly it sounds like the audible version of a squiggly line. 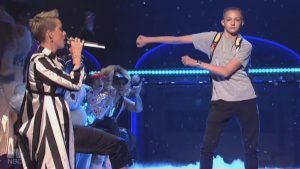 The song itself is basically a help manual on how to perform the “floss dance”—a dance originated by Backpack Kid himself made popular by its inclusion in the video game Fortnite. The chorus is the single line “I be flossin’” sung repeatedly. “But if the song is high energy then at least you can dance to it, right?” you might ask—but no, it is not high energy. The Backpack Kid, or Russell Horning, was only 15 at the time of the song’s release in 2017. For his first foray into the music industry, it is a shame his producers didn’t do a better job. Though the Backpack Kid can be excused due to his age and lack of experience in such a large industry, YouTuber Gabbie Hanna cannot. Her song “Monster” has racked up millions of views—and just as much criticism. The criticism largely stem from an unfortunate interview on Genius’ Verified in which Hanna screams, and it’s not the most beautiful of sounds. Her lyrics fall prey to the quiet killer (or in this case, not so quiet)—melodrama. While the song is poppy and enjoyable to listen to, the lyrics reflect a desire to be deep and meaningful but never progress into any purposeful idea. Abstract concepts also taint the song with little genuine description, such as the line “Bend until you break and you can’t take anymore.” Who is the writer making sacrifices for? What’s even going on? I don’t know, but “go off I guess,” as the teens say. Saving the best for last, Jacob Sartorius is back in the limelight after his last hit “Sweatshirt” with his new song “Better with You.” The tune is, of course, about a girl. My favourite line is “Waiter with my coke who doesn’t care ’bout my health,” which is a deep and critical analysis of how it’s nice to be cared about, but some people just don’t care about you. Welcome to reality, Jacob, it’s a cold world (but you’ve always got that sweatshirt). Honestly, I hope a waiter tells me that what I’m ordering is unhealthy. Small steps like that may someday change the world, and here’s hoping another step in that direction is more mellifluous music, if nothing else.